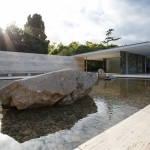 Fundació Mies van der Rohe periodically invites artists and architects to provoke new looks and reflections through their interventions in the Pavilion, enhancing it as a space for inspiration and experimentation for the most innovative artistic and architectural creation. 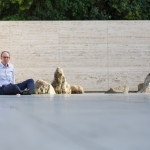 After SANAA, Jeff Wall, Ai Wei Wei, Enric Miralles, Andrés Jaque, Antoni Muntadas, Domènech and Anna & Eugeni Bach, among others, this year this year American artist Spencer Finch will be in charge of intervening in the Mies van Pavilion der Rohe with the proposal ‘Fifteen stones (Ryōan-ji)’. 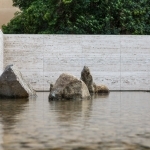 The project, which can be seen from today until October 21 at the Mies van der Rohe Pavilion, links the aesthetics of Mies van der Rohe with those of Zen philosophy. 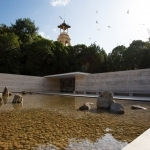 “the temple of Dragon’s rest”, is located in Kyoto and its famous karesansui (zen garden), considered a masterpiece of Japanese culture. 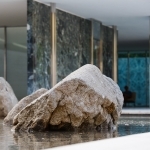 On a white gravel surface of 25x10m, almost the same dimensions as the pond at Mies van der Rohe Pavilion, fifteen stones are arranged in such a way that it is not possible to see all of them at the same time, no matter which is the position of the observer. 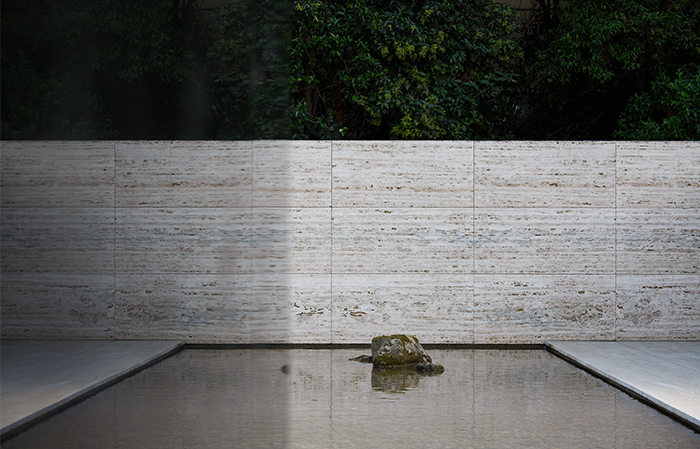 This abstract composition of stones in the space that encourages meditation, is open to interpretation, in the same way that Fifteen Stones. 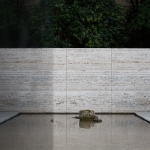 The proposal also refers to the links between the Modern Movement, and specifically the work of Mies van der Rohe, and the Japanese precedent. 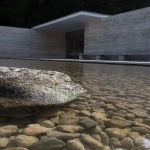 Direct connections have not often been proposed between the way of thinking and working of the German architect and the philosophical and conceptual basis of Japanese culture. 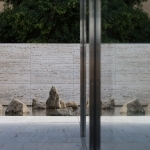 This intervention allows us to reflect on the most lyrical aspects of the work of Mies van der Rohe and one of the most outstanding materials of the Pavilion, the stone, in this case in its natural state establishing a dialogue with the travertine cut, polished and hanging that forms the walls, the pavement and the bench from which the composition is observed. 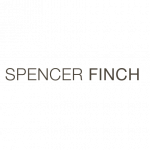 More: Spencer Finch。更多关于他们请至：Spencer Finch on gooood.